Unions need to retire tired tropes http://t.co/iBSilQePis via @BostonGlobe My post-election thoughts on silly rhetoric. Cynically, Lehigh then challenged me to show examples of the union bashing he and other members of the Boston media have made famous. The Globe itself published a column by Joan Vennocchi — “Why The Union Bashing?” [10/17/13] — which highlights these types of attacks, but that is not what I was referring to. While The Boston Herald has the integrity to attack labor without hiding its disdain for workers and their unions, the attacks in the Globe and other media outlets were more indirect, which in a way is more sinister. The argument goes like this: “We don’t hate unions, but here is a list of why they’re terrible and responsible for all our problems.” They set up a straw man, knocked it down and tried to tie it around Walsh’s neck like a millstone. Walsh’s union career is fair game for journalists, no question. What isn’t fair (or responsible) is the way the media attempted to turn a well-rounded candidate like Walsh into a one-dimensional puppet defined by a single issue. The same can be said of their treatment of John Connolly’s education focus. The difference is that one (labor) was framed as a negative while the other (education) was framed as a positive. It’s ridiculous for Lehigh to suggest that unions are forbidden from calling these obvious biases into question. The unbalanced approach was compounded by the media’s refusal to address Connolly’s 18-year career as a corporate attorney. He was never challenged on his contributions from developers, financiers and big law firms. Compare that to the media scavenger hunt for a video of Walsh speaking at a union rally, offered as one of the countless pieces of ‘proof’ that his prospective mayorship would be riddled by union favors. 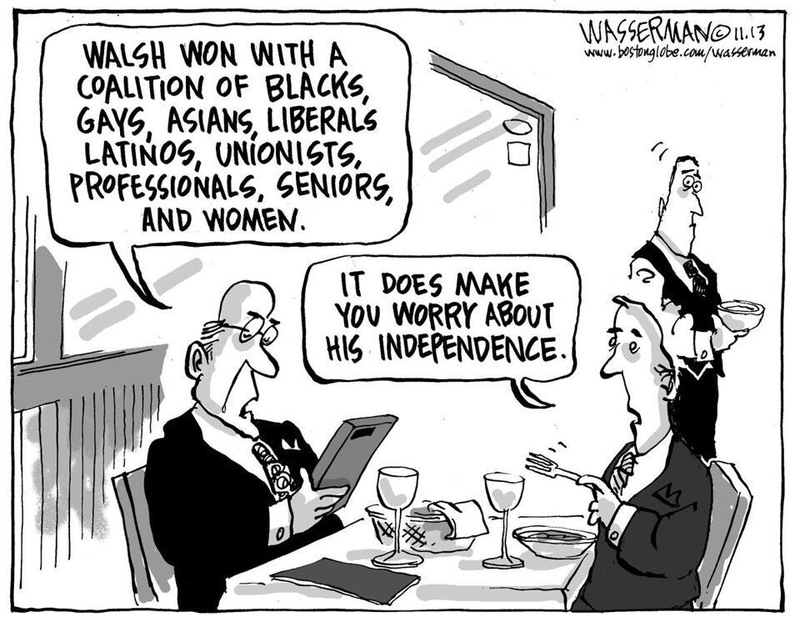 The Herald went so far as to make an ‘anybody but Walsh’ anti-endorsement because of his career as a laborer. And Lehigh? He gracefully compared the Boston Teachers Union to a vampire bite. But heaven forbid union members should be offended. That is just “silly.” The bombastic union blunderbusses should just go away. I guess only columnists are entitled to an opinion. I’ll put it another way: It’s only class warfare when we fight back. The media’s treatment of business candidates presents a glaring contrast. When have they ever challenged a business candidate for his ties to “big business” or asserted that he will give away the public treasury to businesses via tax breaks and contracts? A case in point is a comparison of two columns by the Globe’s Shirley Leung. Her July 24 column, “Businesses Watching Mayoral Race From Sidelines,” lamented the fact that Boston’s business elites, “after failing to put up one of their own,” are simply “sitting on the sidelines in the…mayoral election.” She practically begged these “business elites” to play “kingmaker,” open their wallets, put bumper stickers on their BMWs and swoop in to save our city. Contrast that with her September 11 column, “Can Marty Walsh Be Tough On Unions?,” the premise of which was to question Walsh’s integrity because he received contributions from unions and supported labor at the statehouse. It’s okay for Boston’s wealthiest to play “kingmaker” and pick the next Mayor, but when middle class workers, who live in Boston’s neighborhoods, pool their resources to support a candidate they believe in? Automatic ridicule and scandalization. I expect Lehigh will call me a silly, bombastic blunderbuss. Am I? Take Leung’s July column and replace the references to local business leaders and business groups with local labor union leaders and labor organizations to see what I mean. Can you imagine the Globe printing a column lamenting the fact that Boston’s labor leaders, after failing to put up one of their own, are simply sitting on the sidelines in the mayoral election? Could you see her begging labor leaders to play kingmaker, open their wallets and put bumper stickers on their trucks to save our city? Of course not. Union members and labor unions are supposed to obediently support candidates the media pre-selects for them. They’re not supposed to make their own choices and they’re certainly not supposed to choose one of their own. They might get dirt on the floors of City Hall. My apologies, Scot Lehigh, if I disappointed you by not taking the bait. But I suspect you know that this story is much deeper and broader than what you described as being limited to the Herald’s over the top “Anybody but Walsh” story. Labor unions and their members do not fit neatly into the negative broad stroke stereotypes that the media likes to portray. We are insulted when you attempt to paint us that way and we are not going to cede the public debate and go quietly away. Union members and their leaders are highly trained, hard working, committed individuals who go to work every day, pay their taxes, raise their families and give back to their communities in countless ways. That’s where Marty Walsh comes from and why he’ll make a great mayor. We’re damn proud of him and the citizens of Boston will be too…if you’d just let them get to know him better. Great letter! When will the Globe run it as an op-ed?